When the Duel begins, neither Extra Monster Zone is considered to belong to a specific player. When a player Special Summons a monster to one of them, that Zone then becomes treated as part of that player’s field, and the other then becomes treated as the other player’s field. The tactics of a Duel will change drastically depending on who can grab an Extra Monster Zone first! An Extra Deck Monster can only be Summoned to the Extra Monster Zone! But if you Summon a Link Monster to one of the Extra Monster Zone first, you can utilize it to its max potential! 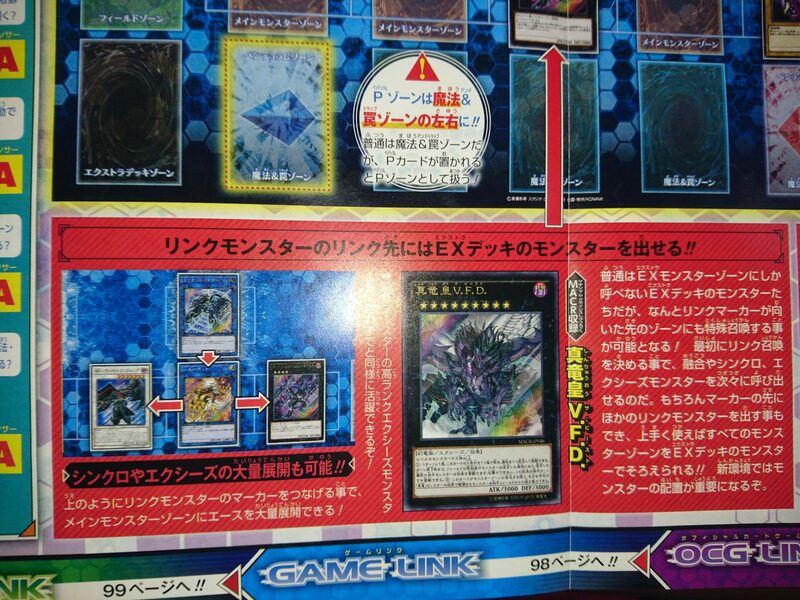 *Extra Deck Monsters, like Fusion, Synchro, Xyz, and Link, cannot be Summnoned to the Main Monster Zone, beware! For info on Link Summoning, check out the Link Summoning article! The Monster Zone of old is now called the Main Monster Zone! Pendulum Zones now take up the Left Most and Right Most Zones of your Spell & Trap Zones instead! And when they do, those Zones become Pendulum Zones! Although Extra Deck Monsters can only be Summoned to the Extra Monster Zone normally, if you have Zones that have markers pointing to them, those Zones can be used to Summon Extra Deck Monsters! So if you get out a Link Summon quickly, you can bring out Fusion, Synchro, and Xyz Monsters in succession. Of course, you can Summon another Link Monster in one of these Zones, so if you play your cards right, you can fill your entire Main Monster Zone with Extra Deck Monsters! The new metagame will require careful consideration of where to place monsters! Super Quick Q&A for the New Rules! Q: If Special Summoned an Extra Deck Monster normally, and it goes to the Graveyard, and I want to Special Summon it with “Monster Reborn”, which Zone does it go to? A: It goes into the Main Monster Zone, not the Extra Monster Zone. Q: Can you use “Book of Moon” on Link Monsters? A: Link Monsters cannot be face-down, so you cannot target them with “Book of Moon”. Q: If your opponent’s only monster is in their Extra Monster Zone, can you attack them directly? A: If there’s a monster in the Extra Monster Zone, unless some kind of effect is in play, you would have to attack that monster first. Q: Can you destroy 2 Set Spell & Trap Cards in your Left Most and Right Most Spell & Trap Zones with “Wavering Eyes”? A: The Left Most and Right Most Spell & Trap Zones are regular Spell & Trap Zones, and do not become Pendulum Zones unless you activate a Pendulum Card in them, or if a Pendulum Card is placed in them by a card effect. A Set Spell & Trap Card in either of those Zones cannot be destroyed by “Wavering Eyes”. Question, what if Pendulum monsters are in the extra zone, can you still pendulum summon them in the main monster zone? Pendulum monsters that were originally main deck monsters can only be summoned to the main monster zones. The only monsters that can be summoned to the extra deck zone are original extra deck monsters: Synchro, Xyz, Fusion and Link. I have some questions…… Can we put monster without have link or extra deck monsters in extra monster zone… to block the “link zone”???? And if i destroy those monsters, the extra deck monsters will be destroed too??? First: Yes, you can summon an extra deck monster in you “extra” monster zone to block yourself… though I have no idea why you would do that. The other extra deck monster zone can still be used by your opponent, you cannot use both zones. Second one is not clear for me either. I presume they can still remain there, but you can’t further special summon on them (like placing an Xyz with higher rank on a lower rank Xyz). But that’s guesswork at this moment, not a fact. Each player may only occupy 1 Extra Monster Zone, so it won’t be possible to ‘block’ it off from your opponent. 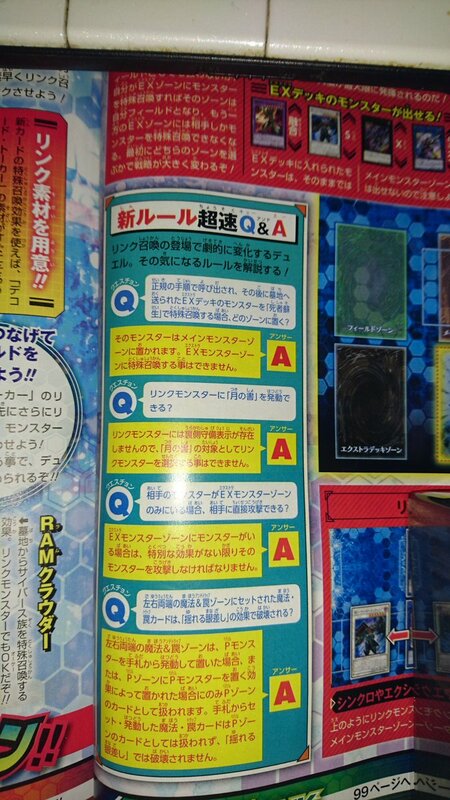 Also so far the info indicate that only when you Fusion / Synchro / Xyz / Link summon that monsters will go into the Extra Monster Zone. More like rebalancing summon spam. But i need to have a Link Monster and need ss in determined zone linked by Link Monster? does that mean that the position of a monster on the main monster zone can’t be changed once a EX-Monster is linked to it ? Also the opponents monsters will be effected by the links if they point to them ? Hmm, do you mean battle position? Or their location in reference to the zone used? And technically yes, the opponent’s monsters would be affected, though there aren’t any cards with such an effect currently. How does this affect Burning Abyss monsters? If you have a Link monster, do Burning Abyss monsters all get destroyed? No rulings are available on that for now, so we will have to wait for further details on the rule changes to answer you. Column Destruction is apparently more relevant than ever. So basically if and when these changes happen, I’d like to point out (Myself included) that many people are going to not spend money on the game. Adding the pendulum mechanic ruined the game for many players also. I hope they can see this is wrong. Can I block my opponent’s extra monster zone with Ojama King/Ground Collapse? More rulings on the matter needed. Its unclear whether Ojama King and other similar cards can target the Extra Monster Zone. Junk Warrior + Dopplewarrior in grave. See my reply above. That’s pretty useful, thanks for sharing! What about effects that special summon extra deck monsters? Like instant fusion or ultimaya Tzolkin? There is no information specific to that for now, so we will have to wait for more rulings. An Extra Deck Monster can only be Summoned to the Extra Monster Zone! But if you Summon a Link Monster to one of the Extra Monster Zone first, you can utilize it to its max potential! So if i ss a bahamut shark on extra monster zone i can’t active your effect? The way I read it implies it only applies to built-in, or inherent, special summoning from the extra deck. That means card like Bahamut Shark and Instant Fusion can special summon an extra deck monster to the main monster zones because they are being caused by a card effect.